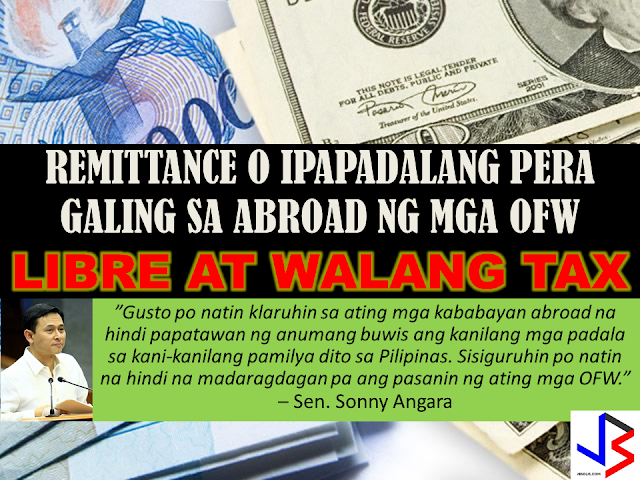 Senator Sonny Angara, chairman of the ways and means committee assures that the OFW remittances will be untouched, will be tax-free with the proposed VAT on money transfer fees. Senator Sonny Angara has allayed the concerns of overseas Filipino workers (OFWs) about the imposition of value-added tax (VAT) on services fees of money transfer centers in the country, ensuring that their remittances will not be taxed. "Gusto po natin klaruhin sa ating mga kababayan abroad na hindi papatawan ng anumang buwis ang kanilang mga padala sa kani-kanilang pamilya dito sa Pilipinas. 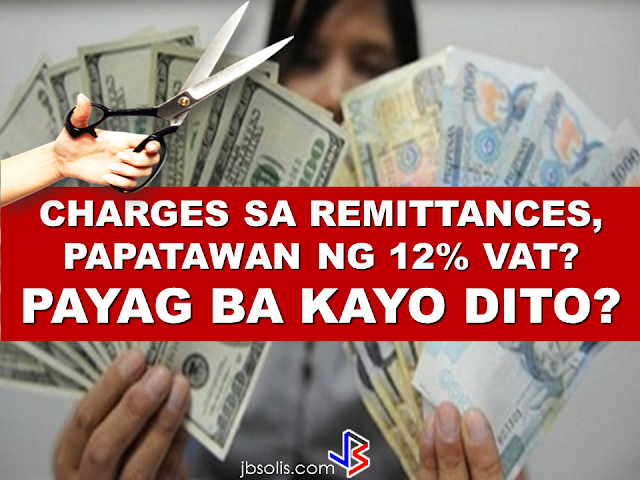 Sisiguruhin po natin na hindi na madaragdagan pa ang pasanin ng ating mga OFW,"
During the committee hearing on Tuesday, Department of Finance (DOF) Undersecretary Karl Kendrick Chua explained that only the service fee of domestic remittances and not the actual remittance will be taxed with 12-percent VAT under their proposal. "Our jurisdiction is only domestic transfers," Chua stressed. For instance, if sending P5,000 within Metro Manila, the money transfer center charges P125 pesos, so the VAT is P15 only. The DOF said such reform targets businesses such as pawnshops, which are initially not registered as remittance centers. Meanwhile, the senator recognized the significant contribution of OFWs in the economy, citing recent data from the Bangko Sentral ng Pilipinas that showed that OFW cash remittances reached $26.9 billion or more than P1 trillion last year, which accounted for 9.8 percent of the gross domestic product. "Pinaghihirapan po ng ating mga kababayan ang kanilang mga ipinapadala sa kanilang mga pamilya dito sa Pilipinas. Hindi naman po makatarungan kung bubuwisan pa natin ito,"
said Angara, who sponsored the law that raised the tax exemption cap of balikbayan boxes. The lawmaker added that OFW remittances are likewise exempt from paying documentary stamp tax pursuant to Republic Act 10022 or the amended migrant workers law. In addition to broadening the VAT base, Package 1 of the Duterte administration's comprehensive tax reform program seeks to lower personal income tax rates, and to adjust excise taxes of petroleum products and automobiles. House Bill 4774, a proposal to increase the value-added tax on the service fee of money remittances draws ire from the OFWs. The additional VAT on the service fee will directly hit the remitters and not the remittance companies. Eman Villanueva, an OFW based in Hong Kong said that the additional VAT will be an additional burden for the OFWs like him because the remittance companies are expected to pass the levy to the remitters rather than shouldering the cost themselves. Image from BusinessWorld regarding OFW remittances.